At Spectrum Electric, we’re an electrical service in Orlando who built our business on providing top-notch service and 100% customer satisfaction to homes and businesses throughout the Central Florida area. We're locally owned and operated, and have been providing service to Central Florida for over 24 years. 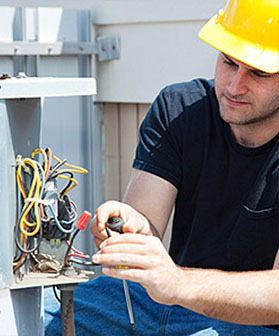 Our customers love us, not only for the work we do, but also for our highly competitive rates, timeliness, and ability to solve almost any electrical issue in nearly any environment. Our technicians are expertly trained in all facets of electrical troubleshooting and repair, and have passed a stringent series of internal certifications, ensuring that the service you receive from a Spectrum Electric technician is unparalleled in the industry. We’re an excellent electrical contractor in Orlando, whose technicians are thoroughly screened, to make certain you're completely comfortable welcoming them into your home or office. We're licensed and insured, protecting you and your investment. Typically, we can answer your service call within one day, and most issues can be resolved on the same day we arrive. We have most normal replacement items in stock, allowing us to deliver an appropriate solution without unnecessary delays related to product ordering and delivery. There is no job too large or too small. We pride ourselves on "serving all your electrical needs". All first-time customers and senior citizens receive 10% off all labor charges on service calls. It's our way of saying "thank you" for choosing us as your electrical service in Orlando.